We had a room full for the January Retiree’s Luncheon. All eight tables, which has eight chairs each were full, and they had to bring in another smaller table later, a fine crowd. Don McManus was our first-timer. Something a little different this time, we had six Chiefs of Maintenance present, which included Homer Keisler, Ed Fisher, George Inabinet, Charlie Savage, Russ Rushe, and Mike Metzler, very impressive group. Our featured speaker was Lt. Col. Michael “Vito” Ferrario, the 157th Fighter Squadron commander, and he was also the commander during the recent deployment to Southwest Asia. He detailed some facts and told us what all they had to go through, very interesting to listen and appreciate the rigors as to what our deployed folks encountered. An interesting note, many of us were not familiar with Vito, so we accused him of ‘flying under the radar’, which he admitted he liked to do. He told us he had 12 years of active duty service and his last job on active duty was to travel to different bases, one of his stops was at McEntire for about a week, and that convinced him this is where he wanted to be. So when an opening came up, he and his family reported for duty at McEntire. At the end of our Luncheon, we had our Memorial Service for the known 27 retirees that died during the 2018 calendar year, as well as the 19 known non-retirees. From my research, I have determined we have 72 folks that are currently not on our Monument, probably more than that, just haven’t found some yet. Vito went back to the base and found out there is a $10,000 allocation for the Monument this fiscal year. Chief Master Sgt. Rob Wright is tasked with getting contracts to ‘catch up’ the Monument in the near future. 1. William Leroy “Roy” Campbell, he died May 9, 2015. I have mixed messages about his retirement. Roy lived in Darlington and was born in Darlington County in 1947. He was a U.S. Army Veteran of Vietnam, then later joined the S.C. Army National Guard. He must have transferred to the SCANG in 1985. He was a Desert Storm Call-Up as a technical sergeant assigned to the 169th CAMS. His obituary states he retired as a technical sergeant and I have him retiring in 1992, however, information from the TAG Building states he was in the SCANG from 1985-1993, and that he was not a retiree. No matter, his name is on the Monument, he served his country as a Vietnam Vet, Army National Guardsman, and later an Air National Guardsman. I did not find his picture in the 40th Anniversary Book (1986). 2. William Jeffcoat, he passed away Sept. 2, 2015. His obituary states he served in the U.S. Army and Air National Guard. I have him retiring in 1998 as a staff sergeant. He graduated from Batesburg-Leesville High School in 1980 and was a graduate of Benedict College in 1992 as a Criminal Justice major. In the picture on his obituary, he looks to be wearing a police uniform with a badge. He was buried at Fort Jackson National Cemetery. It appears he was a Desert Storm Call-Up as staff sergeant assigned to the 169th CAMS. At this time, this is all I can tell you about him. 3. Robert R. Hicks, he was an Active Associate member, killed in a multi-vehicle motorcycle accident, Sept. 12, 2015. He had to be in Maintenance since I received an email from both Chief Wright and Maj. Doyle in Maintenance, who wrote Senior Airman Hicks was survived by his wife and seven-month-old daughter. He was taken back to Michigan by his family for burial. This is all the information I have on him. 4. Daniel H. Bailey Jr., he passed away at age 33, Nov. 1, 2015. He was a current member who lived in Lugoff. He was cremated and had a private inurnment at the Florence National Cemetery, which tells me his roots were in Florence. He was a graduate of Francis Marion University and he served in the Army National Guard. He deployed to Kosovo as an Army Guardsman, later he served in Operation Enduring Freedom in Afghanistan as an Air Guardsman. When he passed he was a technical sergeant in the SCANG. He is survived by his wife and two daughters. 5. Jackie P. Lemacks, he passed away Nov. 7, 2015. I believe he was born in Maine. He was in the U.S. Navy prior to joining the SCANG. His picture is in the 40th Anniversary Book, Page 103, top picture, the 169th CAMRON Support Staff. I am not entirely sure about this, but at one time he was married to the base commander’s secretary, Barbara. She died, or they were divorced, and he remarried and moved to Wagener which is where he died. I recall some of our folks went way out into the country for his funeral services, later he was moved to Fort Jackson National Cemetery. I am not sure when he showed up at McEntire. I didn’t find him in the 25th Anniversary Book (1971). I have him retiring in 1992. He was a Desert Storm Veteran and was a master sergeant assigned to the 169th CAMS. 6. Wesley F. Thompson, “Tommy”, one of our 1985 Retirees. He retired as a master sergeant and from his obituary he lived in Allendale, however, he worked for years on Edisto Island. There is a Wesley F. Thompson III that was an A2/C assigned to the 169th CAMS as a Berlin Crisis Call-Up, I’m assuming this is the same person, too coincidental. I did not find him in the 25th Anniversary Book so I can’t tell a whole lot about him. He passed away Nov. 17, 2015 and was buried in Allendale, South Carolina. 7. Richard R. Penix, one of my old golf buddies from Aiken. We used to play in the old GAGGO’s and the Eastern ANG Open at the beach that was sponsored by McEntire for years. Richard and his fellow Aiken buddy, Sam Wallace- another Air Guardsman, would play together a lot. Richard was one of our POL guys. He was a Desert Storm Veteran, and if not mistaken, he was the NCOIC during Desert Storm at Al Kharj. I went to his funeral in Aiken and wore my SCANG Retiree jacket, his wife saw it and said he loved that jacket, he wore it all the time, he had me get him one. He died Nov. 22, 2015. He was a traditional Guardsman, but he also retired from Westinghouse at the Savannah River Site. He loved his code name of “Trickie”, even used it in his email address. Just a really neat guy to be around. 8. James E. Easterling, he was 73 when he passed away Jan. 23, 2016, originally from Orangeburg County. He was a 1991 retiree. He retired as a master sergeant and was also a Desert Storm Veteran as a master sergeant assigned to the 169th CAMS. He was an Ammo guy (Munitions). His picture is in the 40th Anniversary Book, Page 114, bottom picture, 169th CAMRON Munitions Storage. After retiring, he volunteered at the Four Holes Volunteer Fire Department. Later he must have moved to Whitakers, North Carolina, and then later he died in Emporia, Virginia. 9. Robert L. Giacobbi, “Bob”, a WWII Veteran. He was a 1984 Retiree from the SCANG as a senior master sergeant. If you went to the chow hall, you saw Bob Giacobbi. He also retired from the Post Office. I used to see Bob all the time at Fort Jackson Golf Club back in the old days, he was always one of the first groups to tee off. I never played with him but used to talk to him some while waiting on frost delays. The last time I saw Bob before he died was at Mr. Bunky’s, it was a Saturday night when either steak or quail was offered. He was enjoying his quail. We talked for a while and reminisced. He passed away at age 91, almost 92, Feb. 15, 2016. A really nice guy. 10. Ralph E. Hutchins, he died March 3, 2016. He was a 2005 Retiree. He retired as a master sergeant assigned to the Fire Department. He was an Assistant Chief and served 28 years there as well as working for a private company as an EMT. He was just one of those individuals that loved helping people. Unfortunately, he had a long battle with cancer which finally got him. Interesting enough there was a funeral service for him at the McEntire Fire. He is on Page 126, bottom picture in the 40th Anniversary Book. 11. Furman D. Mattox, who was 78 at the time of his death, April 19, 2016. I went to his funeral since I knew the family, particularly his brother and sister-in-law. According to his obituary, he served 33 years in the Air Guard, 26 of them in Supply. He also retired from Mattox Electric after 26 years. Furman was a 1989 Retiree, he retired as a senior master sergeant. He is pictured in the 25th Anniversary Book, Page 89, 169th Supply, Material Facilities. He is on Page 122 in the 40th Anniversary Book, bottom page, 169th Resource Management Squadron. He was a Berlin Call-Up assigned to the 169th CAMS as an A1/C, he must have switched jobs right after the call-up and went to Supply. Good man, from a good family, lived in the Blythewood area most of his life. 12. Kenneth D. Wood, “Ken”, he passed away May 11, 2016, at his Myrtle Beach residence, although he was a West Columbia resident. He was 68 at the time of his passing. He was a 1990 Retiree as a master sergeant. Interesting enough, both Ken Wood and Furman Mattox served side by side in Supply for years and they both died within a month of each other. Ken is pictured on Page 89, top picture, 169th Supply, Equipment Management and he is on Page 122 in the 40th Anniversary Book, bottom page, 169th Resource Management Squadron, standing right next to Furman Mattox, almost a little eerie? 13. James T. Chumley, “Jim”, he passed away July 6, 2016, he was 74 at the time of his passing. 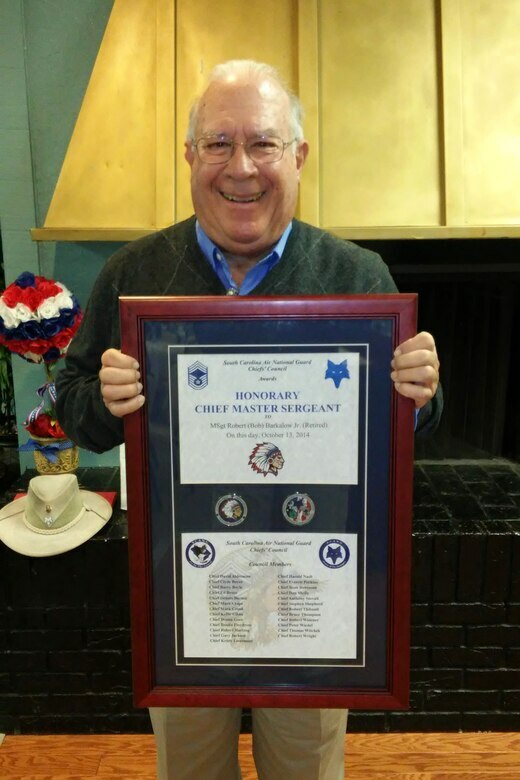 He retired in 1993 as a chief master sergeant. Interesting guy, he was involved in a lot of things, both with the Guard and with the community. He joined the Air Force in 1961 and he served with the Armed Forces Radio and Television Services many places overseas including Turkey, Greece, Germany, and Pakistan. He was one of those individuals that had that ‘radio’ voice, very smooth and mellow. He was the Master of Ceremonies in many local events and beauty pageants. He worked as a broadcaster for different TV stations, local and out of town. He went to Desert Storm as part of the 169th Tactical Fighter Group. I recall seeing him all over the base at Al Kharj, talking to people and gathering information. After he retired, sort of lost track of him, one day he called me up and wanted to join the SCANG Retirees address book, he told me he was having a hard time medically speaking. He and I were the same age and grew up in the same era. He graduated from high school in Woodruff in 1959. An interesting fellow doing a lot of things with his life. Note: In the December Retiree’s Corner, I mentioned I had no idea who B. E. Tomlin was and sort of still don’t. However, Nelson McLeod found him with Find a Grave. B. E. Tomlin is Billy Eugene Tomlin born in Toombs County, Georgia, Oct. 1, 1943. He is buried at Fairfax in Allendale County. He passed away Aug. 1, 2014, at age 70. I still have no documentary information on him other than the fact he was both a Vietnam and a Persian Gulf Veteran, based on what his grave marker states. If he was stationed at McEntire and was a Desert Storm Veteran, he was not one of our Call-Ups according to the ‘History of Operation Desert Shield/Storm’ published by the S.C National Guard, which lists all members deploying to Desert Storm. At our Luncheon, I asked if anyone knew him, nobody could recall him at all, even had some Headquarters folks there that normally would have remembered him. At this time, I am submitting he may have been a member of the Georgia Air National Guard since he lived in the southern part of South Carolina. I found nothing on him at the TAG Building, so he is an individual that is still in limbo, although his name is engraved on our Monument as B. E. Tomlin. Next month, our Luncheon will be February 5th at our usual place, the Fort Jackson NCO Club beginning at noon. I have been promising a raffle and we will do it then. Come if you can, we love to see you no matter if you come once a year or every Luncheon. I like to think we have fun, enjoy ourselves, and chatting with our fellow members and spouses, and above all, being informed by our ‘featured speakers’ from the base. See you then.